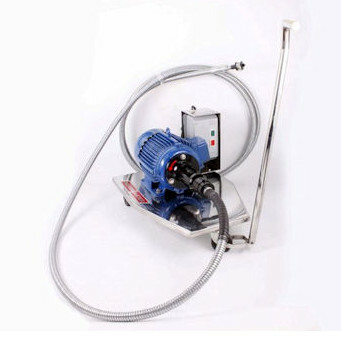 Powermaster Model ATC-300 Extra Heavy Duty Pneumatic Tube Cleaning Machine includes air filter, regulator, lubricator, adjustable speed/torque control, tool storage box and air foot paddle. Shaft rotation can be set at optimum speed for each application. Excellent for application where using electric equipment is hazardous. 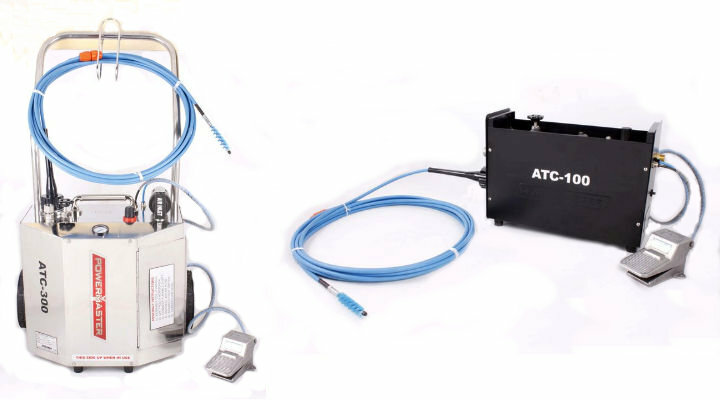 The ATC-300 uses a cleaning tool mounted to the tip of a flexible shaft, which is available in different lengths and diameters to fit the size of the tube to be cleaned. For wet applications as the shaft rotates inside its watertight nylon casing, the unit feeds water through the casing to the cleaning tool. A foot pedal controls shaft rotation and water flow. While the operator feeds the rotating shaft assembly through the tube, the water flushes out deposits as they are loosened. 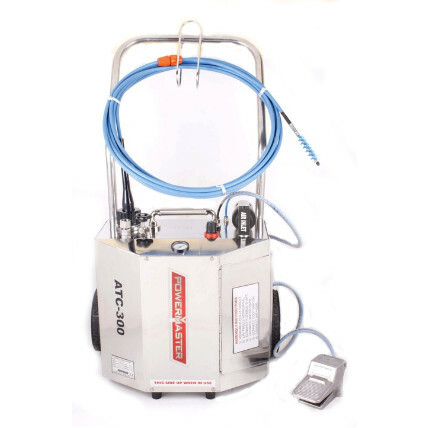 Model-ATC-100 Portable Pneumatic Tube Cleaning Machine includes FRL unit, adjustable speed/torque control, and air foot pedal. 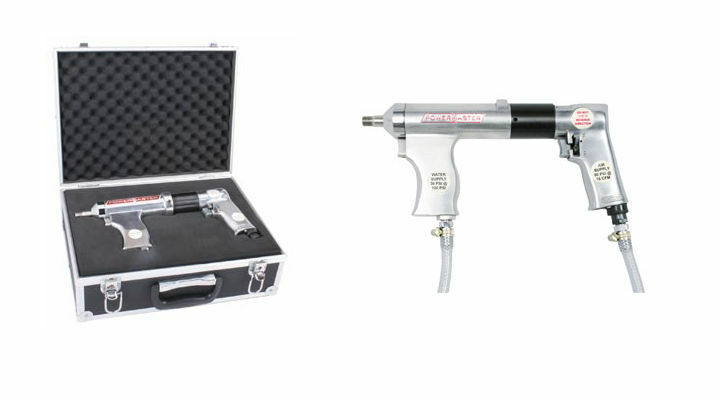 The ATC-100 uses a cleaning tool mounted on the tip of a flexible shaft, which is available in different lengths and diameters to fit the size of the tube to be cleaned. For wet applications, as the shaft rotates inside its watertight nylon casing, the unit feeds water through the casing to the cleaning tool. A foot switch controls shaft rotation and water flow. While the operator feeds the rotating shaft assembly through the tube, the water flow softens the deposits before cleaning and flushes them out during cleaning. 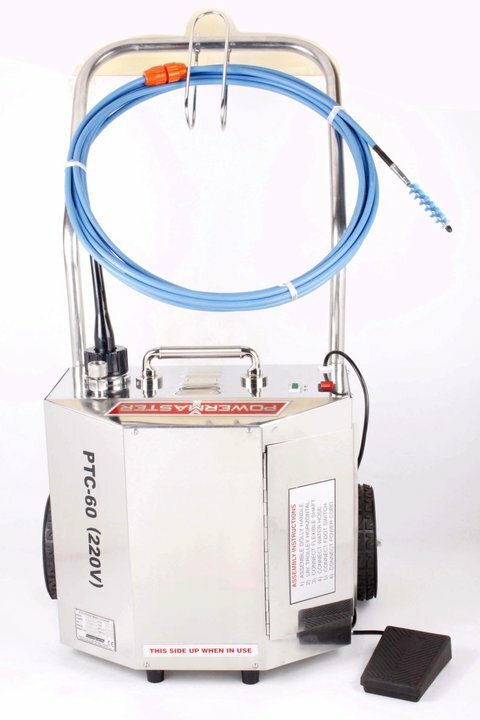 Operation : The portable pneumatic tube cleaners use hollow shafting of different diameters as per tube I.D. to be cleaned which can be coupled together to form lengths as per the length of the tube to be cleaned. Water flows through the hollow tube and washes out deposits that are dislodged by the cleaning tools attached to the driven shafts. 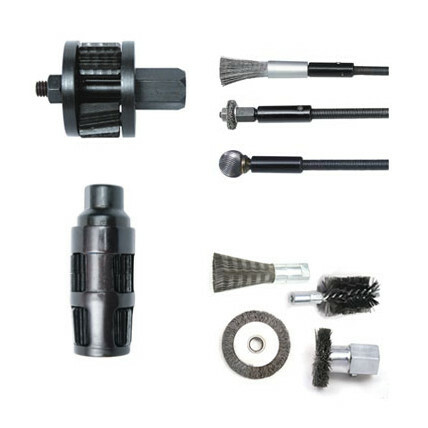 Typical cleaning tools used are carbide drills for severely clogged tubes, brushes for light deposits and buffing tools for final polishing of tubes. The water flow is independently controlled allowing the user to determine how much water is needed in the application. 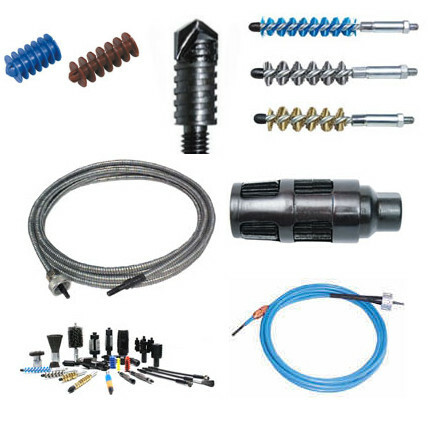 Model C-10 is typically used on oil coolers, small heat exchangers and condensers. Model CP-315 is typically used on larger diameter tubes of process vessels, heat exchangers and condensers. Note: The pneumatic tube cleaners above are supplied with a heavy duty metal carrying case with separate provision to house up to 8 X 4ft. (1.2m) long hollow shafts, 15ft (4.6m) air hose, 15ft (4.6m) water hose.